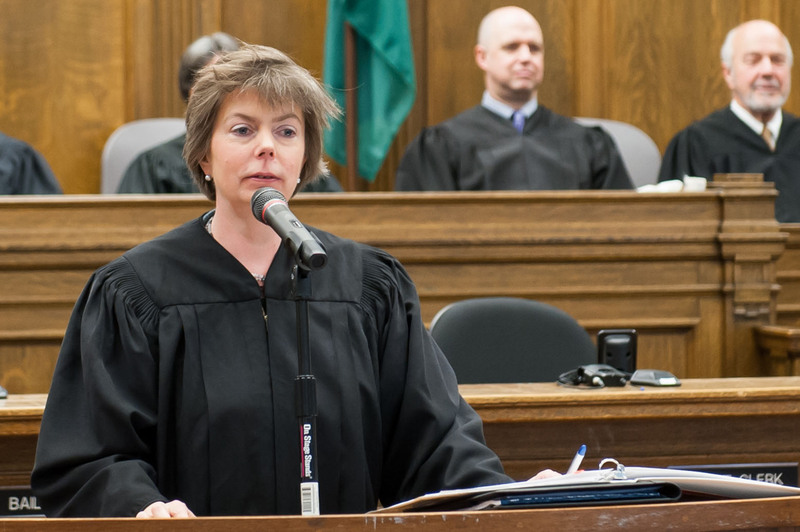 King County Superior Court Presiding Judge Susan Craighead is one of many Court leaders encouraging the use of implicit bias training and awareness among other criminal justice leaders and their staff. Judge Craighead also serves on the Juvenile Justice Equity Steering Committee, a group collaborating on solutions to end racial disproportionalities in the juvenile justice system. Recently, I sat next to a businessman from southern Utah on a plane. Like the rest of the country, we found ourselves reflecting on the apparently unjustified shootings of African-American men by police officers in Baton Rouge and Minneapolis. When he found out I was a judge, he was full of questions. “Do you think police really are biased against African-Americans?” he asked me earnestly. One thing I observed about Utah is its homogeneity – it is full of blonde, blue-eyed families. No wonder this was a mystery to him. He had not. I explained that the IAT is a 10 to 15-minute online assessment designed to measure one’s unconscious bias. You can take a test on race, on gender, on sexual orientation, on weight – there are a whole variety. The test involves sorting words and pictures by hitting certain keys on a keyboard. Bias in the test occurs when people are faster at categorizing negative words when they are paired with African-American faces, or faster at sorting positive words when they are paired with white faces – suggesting an uncontrolled mental association between negative things or concepts and African-Americans. Hundreds of thousands of people have now taken the IAT on race, and the results show that most white Americans are implicitly biased in favor of white people, to varying degrees. Nationally, it appears that there is more bias in the Southeast and the East than there is in the West. But the point is that most of us are biased and we don’t know it – even some African-Americans discover that they have an implicit bias in favor of whites, demonstrating that our culture is inculcated into Americans of all races. It is likely that if every American took the test (as opposed to those of us already concerned about racism in our society), the whole country would turn out to be more heavily biased in favor of whites. So, I told my seat mate, I would bet that if every police officer in the country took the IAT, they would find that—like almost everyone else— they have been acculturated to develop an implicit bias in favor of whites over African-Americans. As I drove to Utah, I listened to a lot of radio, and I heard police officers call in expressing frustration or even rage at the suggestion that they were biased against African-Americans. I wanted to scream, “Yes, you are – just as almost everyone is. It is does not make you a bad person!” It does mean you should be aware of the implicit bias as you encounter people of different races and make decisions that affect or even take lives. And then, I told my curious companion, every white police officer should read Waking Up White by Debbie Irving. I read the book during my trip at the suggestion of Chief Juvenile Court Judge Wesley Saint Clair. Frankly, most white people in positions of power should read the book. The author grew up in a quintessentially WASP family in New England, freighted with privilege dating back to early American homesteading in Maine. She portrays herself as utterly clueless about the history of racism in America. She devoted much of her life to improving the lot of poor, mostly black and brown children as a second grade teacher. As the years went by, she became increasingly aware that there was something she was missing when it came to race, but she could not identify what it was. Under the leadership of my predecessor, Judge Richard McDermott, the entire King County Superior Court bench watched the documentary and many of us took the IAT. We spent hours at a retreat discussing the implications of implicit bias for the justice system. Since then, our Courts and Community Committee has organized an Equity and Social Justice Book Club. Next week, we will be meeting to discuss the recent violence that has resulted in dead African-American men and dead police officers. To find out more about King County Juvenile Court’s efforts to reduce racial disparities in the criminal justice system, please contact the Court’s Equity and Social Justice Advocate, Jason Clark, at Jason.Clark@kingcounty.gov.